Logins this hour: 26099 ? Amion lets you trade shifts with colleagues. Choose a shift you to give away, the person who will take it, and a shift that you will take in return. You can also tag shifts you would like to give or trade away. You and your colleagues can then propose swaps from the trade pool. 1. Log in to your group's schedule at amion.com. On the main toolbar at the top, click on the swap icon . 2. Enter your personal password. If you don't have a personal password, click I don't know my password and choose your name. Amion emails you a starter password and a link that takes you straight to the trade calendar. Once there, you can set your personal password to something that's easy to remember. 3. The swap calendar displays all your shifts. Select the shift you want to trade. Or choose to pick up a shift without trading one away. 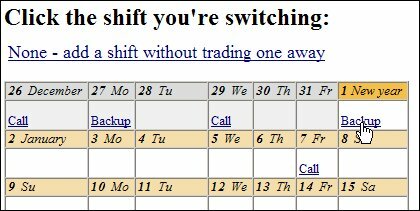 You can only select shifts from the current date onward. 4. Select the person with whom you are trading. A calendar appears with your colleague's assignments alongside yours. Choose the shift you'll take. Or click "Choose a trade partner from the swap pool" and you can choose the to pick up from a pool of shifts your colleagues have marked as available. 5. Amion summarizes the proposal and you can submit the swap request. 6. Amion emails your colleague to confirm the trade. The switch will appear in the schedule only after your colleague agrees to the trade. When a swap is confirmed, amion.com emails you to say that your colleague accepted the trade. It also emails the person in charge of the schedule so that she's aware of all trades. If you're unsure whom to trade with, advertise your shift to giveaway to your colleagues. Select the shift you would like to giveaway and then choose to make available to anyone who wants it. 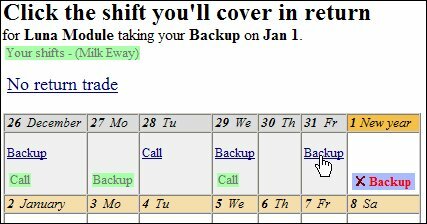 Your shift will be placed in the swap pool and your swap calendar will display a broadcast icon, next to the shift. Click the beacon to send a note to your colleagues. You can explain your needs, the urgency, etc.